Just think; it all could have been avoided if she had only been invited to that party. 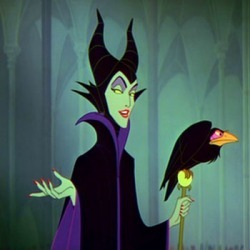 However, the devilishly delightful Maleficent is only too proud to let this royal snub go by without due recourse, which she provides a cursed spinning wheel. And if that doesn't work, then she can always turn into a fire-breathing dragon. At Aurora's (Sleeping Beauty) christening, Maleficent appears, expressing disappointment in not being invited to Aurora's christening ceremony and curses the princess to die when she touches a spinning wheel's spindle before the sun sets on her sixteenth birthday. Maleficent leaves, and Merryweather is able to use her blessing to weaken the curse so that instead of death, Aurora will fall into a deep sleep until she is awakened by true love's kiss. Gaston is the golden boy of his provincial town, an ace hunter whom all the girls go ga-ga for and, oh yes, every last inch of him is covered with hair. So why can't Gaston nab the beautiful Belle for his bride? Must be all that reading she does. No matter, with an ego the size of his pecs, he is certain he'll win her over... or else. He is amazed when Belle doesn't want him and laughs at the idea that she could want anyone else, especially the Beast. "Were you in love with her, Beast? Did you honestly think she would love you when she could have someone like me?" No one's got an ego quite like Gaston...amongst other things. In Sleeping Beauty, set in the 14th century, the newborn Princess, Aurora, is named after the Roman goddess of the dawn because she fills the lives of her mother and father, King Stefan and Queen Leah, with sunshine. While still an infant, she is betrothed to the also-young Prince Phillip, son of King Hubert, so that the kingdoms of Stefan and Hubert will be forever united. At her christening, the Three Good Fairies Flora, Fauna, and Merryweather arrive to bless her. Flora gives her the gift of beauty while Fauna gives her the gift of song. Before Merryweather can give her blessing, the wicked fairy Maleficent appears, expressing disappointment in not being invited to Aurora's christening ceremony and curses the princess to die when she touches a spinning wheel's spindle before the sun sets on her sixteenth birthday. Maleficent leaves, and Merryweather is able to use her blessing to weaken the curse so that instead of death, Aurora will fall into a deep sleep until she is awakened by true love's kiss. The wicked fairy godmother was aptly named "Maleficent" (which means "Evil-doer"). In determining Maleficent's design, standard depictions of witches and hags were dismissed as Davis opted for a more elegant look centered around the appearance of flames, ultimately crowning the villain with "the horns of the devil." In the event the individual character of the three good fairies and the elegant villain proved to be among the film's strongest points. When she is told that she is not wanted at Aurora`s christening her pride is bruised and she puts a curse on Aurora. Essentially, the entire story of Sleeping Beauty, and ultimately Maleficent`s downfall stems from her being told her was not welcome at a party. Pride leads to her doom. Gaston, on the other hand, takes pride to a whole new level. The man is genuinely in love with himself. He will do anything to get what he wants and ultimately only goes to attack the Beast so he can have Bell (who has no interest in him...which he fails to understand) all to himself. Once again, it is pride that causes his downfall. Wikipedia defines Gaston as "A highly egotistical hunter who vies for Belle's hand in marriage and is determined not to let anyone else win her heart, even if it means killing her true love." Betsy Hearne, editor of The Bulletin of the Center for Children's Books, writes that the film belittles the original story's moral about "inner beauty" through the character of Gaston, as well as the heroine herself, in favor of a more brutish struggle; "In fact," she says, "it is not Beauty's lack of love that almost kills Disney's beast, but a rival's dagger."